Thanks to the drought 😦 , the mosquitos that usually make the Sky Lakes Wilderness a forbidding place in July and August didn’t materialize 🙂 this year in their usual great numbers. We’ve been taking advantage of their absence to explore most of the trailheads that allow one to access different parts of this long, linear wilderness – which stretches along the Cascade Crest from Crater Lake National Park to Mount. McLoughlin. Today we explored the Nannie Creek Trail (USFS #3707), which provides access to the lakes on the east side of Luther Mountain . This trail is popular because it starts higher (about 6,000 feet), is well maintained, and has views. But it comes in above the lakes, so there’s a 400 foot climb on your return. This is Hike #50 in Sullivan’s 100 Hikes in Southern Oregon (3rd Edition). before reaching the larger of the Puck Lakes (an excellent dayhike destination but also good camping). with a vista to the south. Margurette Lake and Trapper Lake (and many other, smaller lakes) are in the trees below Luther Mountain. Because the Loved One’s knee was acting up, we turned around at the Viewpoint, so 7.8 miles round-trip, with 500 feet of elevation gain. 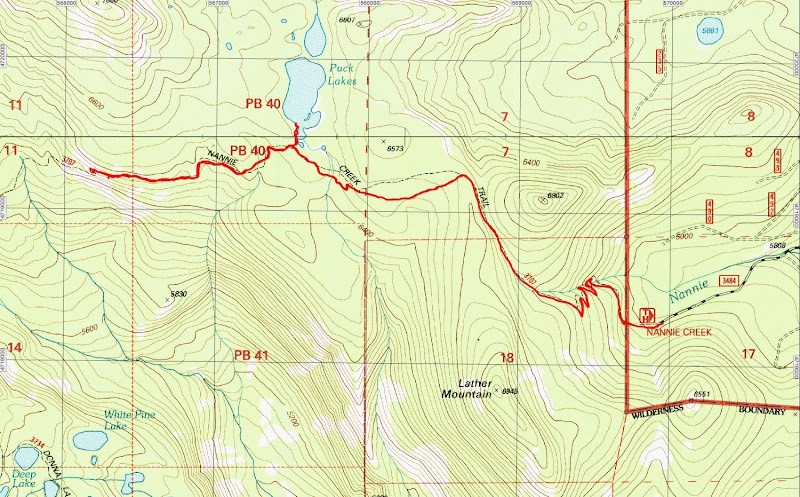 If we’d been able to continue, it would have been less than 2 miles to the lower lakes.